Trihedral is a major Canadian designer and integrator of ship-board monitoring and control systems. We specialize in alarm and monitoring, tank gauging, pump and valve control, engine monitoring and many other solutions for a variety of government and commercial vessels. Interface options range from pushbutton panels, to simple digital alarm readouts, to redundant panel mounted PCs. Any number of devices can be tied into the system including peripheral devices such as autopilot and GPS, and standardized drivers have been developed for engine control units (ECU) typically used in the marine industry. VTScada systems are often expanded to incorporate additional shipboard systems. Expansion modules are not included as standard features of the core product, but are customized to meet specific customer needs. This is Trihedral’s most common, standardized product for the Marine industry. The product returns mission-critical vessel alarm and status data to a central operator interface. This is achieved by using a distributed system to concentrate alarms within a network of control panels throughout the ship. This reduces wiring and significantly reduces costs. These panels are interconnected via redundant field busses and centralized alarm management is controlled by a redundant PLC pair. 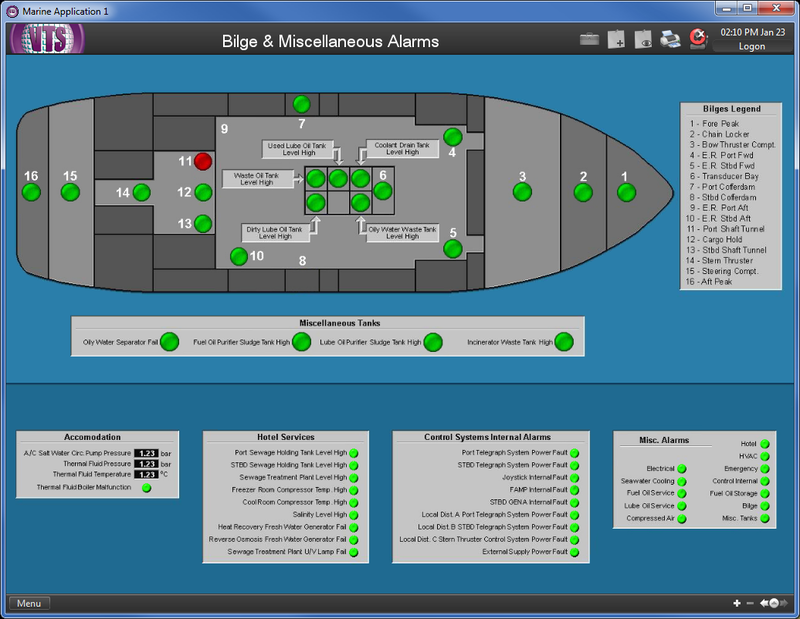 PC-based user interfaces are distributed in key areas of the ship and alarm acknowledgement is synchronized with the PLC. 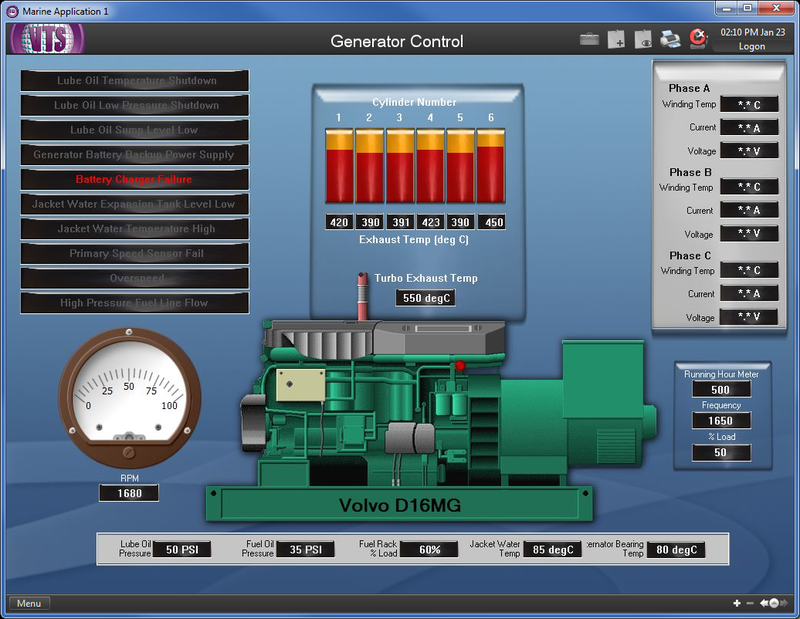 In addition to graphical system overview and alarm management, the system includes data-logging and trending. VTScada’s marine pump and valve control is fully customizable and combines the control functionality and system protection of a PLC with the supervisory control of a user interface. 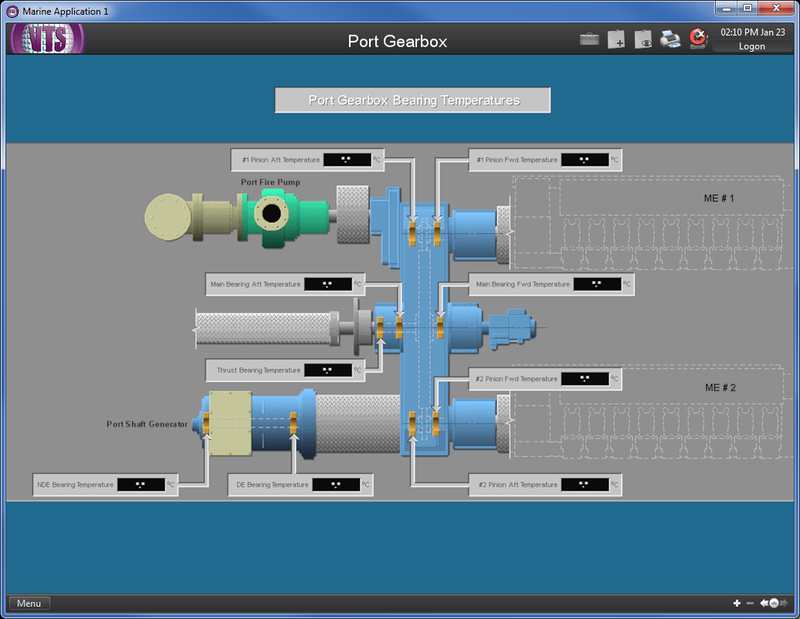 Devices can be displayed either as a list of analog and digital status and control items, or can be displayed in a graphical layout which mirrors the actual process. 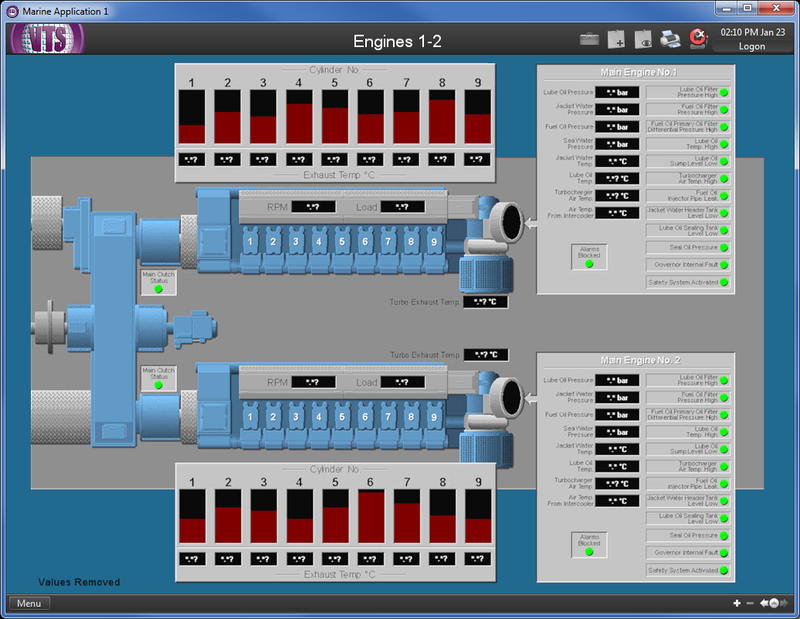 This allows operators to remotely monitor and control the entire ship’s pump and valve system. Operators can provide any number of control commands to digital and analog devices and can customize VTScada to include control strategies for pump and valve system management. VTScada uses hydrostatic sensors or pneumatic bubbler system to read tank levels. These values are returned to the centralized monitoring interface and are cross-referenced against the ship’s sounding tables to improve accuracy. 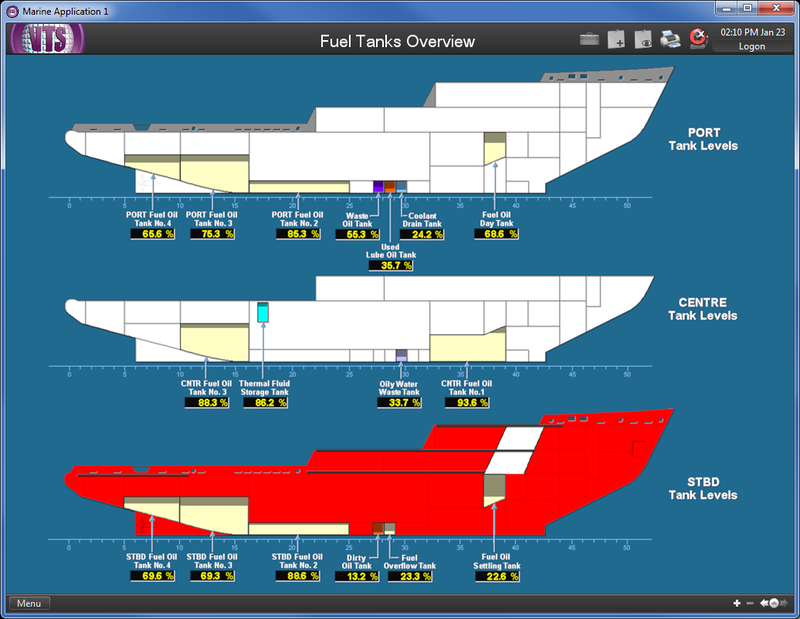 The user interface accurately reflects the physical layout of the ship, rather than a simple list of tank levels. The layout is generated from a photograph of the ship. Alarms and levels are then easily located by their position on the graphic. The VTScada marine engineer’s callout system is rarely a standalone system, but usually provides extended functionality to other applications, such as Alarm and Monitoring or Engine Monitoring. Callout interfaces consist of digital readouts in cabins, mustering points, bridges or other strategic locations. Group alarm displays provide alarm annunciation and allow remote alarm acknowledgement. Alarm escalation may be included for Unmanned Machinery Space applications where deemed necessary. Engines and generators using standard control panels and industry standard communication protocols can be fully integrated with the alarm and monitoring system to annunciate critical alarms and to gather historical data.